Food mills are used by chefs and home cooks alike for making purees, sauces, and pastes. They are basically a grinder with a built-in strainer that filters out seeds and skins from fruits and vegetables. But, not all food mills are the same and some work better than others. Read on to decide if this is the model for you or read more about it at Amazon. Comparison Table: How Does the Weston Compare to Others Reviewed? This food mill includes 3 milling discs of different sizes. The fine disc (2mm) is best for fruits and veggies with small seeds like tomatoes or when you want a super fine puree like for baby food. The 3 mm medium disc is used for most other fruits and veggies while the 8 mm is often used for chunkier purees and mashes for potatoes and root vegetables. The discs are stainless steel and able to be washed in the dishwasher. This makes a food mill more durable. It also means it will stand up better to hot liquids than some of the plastic models. The capacity of the bowl is about 2 quarts although you usually only fill a food mill half way. This reduces the mesh from liquids sloshing around during the milling process. This size is good for most home cooks for family-sized servings. The manufacturer says this food mill is dishwasher safe. I prefer to handwash this type of kitchen tool myself. So, if you do put it in the dishwasher, I recommend the top rack. I would also consider washing the discs by hand. Like knives, they may dull in the dishwasher from prolonged heat. User reviews on this Weston Food Mill are mixed. Most online reviews are positive and state that the machine works well. The hande cranks smoothly and easily. It is easy to clean and easy to use. Many more people are happy with the unit than are unhappy. But, there is a significant number of complaints about this model too.The main problem seems to be the stability of the unit. You see, when using a food mill it sits on top of a bowl to catch the pureed food. If the mill is not stable in the bowl, it will move and rock as you turn the handle. So you have to keep a tighter grip on it to keep the bowl from turning over and to hold the food mill in place. There are other models that have little feet that stabilize the mill in the bowl. Is that a big problem? Maybe. If you are looking for an inexpensive food mill for occasional use, it probably isn’t that big of a deal. But, if you will be using your food mill to can a bushel of tomatoes, this will get annoying really fast. 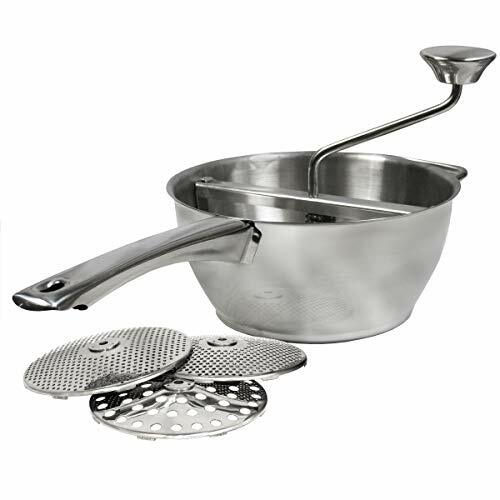 The Weston Stainless Steel Food Mill does have a lot to offer. It is easy to use, includes 3 different sized discs and is also easy to clean. Generally, reviews are positive for this model. It does seem, however, that improving the stability would go a long way in making this a better model. Adding feet to the unit would keep it from rocking around in the bowl when it is being used. This would probably be an ok food mill for the occasional or beginner user who doesn’t want to pay for a top of the line model. But, if you will be using a food mill weekly, I would look for a model that is a little more user-friendly. You can read more about my favorite food mill here. So, what do you think about this one? Do you have any experience you would like to share? If so, please do in the comments below!